Two 10-megawatt solar photovoltaic (PV) power generation plants, built by State Development & Investment Corp (SDIC) and China Guangdong Nuclear Power Corp (CGNPC), will soon be completed and be fully operational by July 30, as a pilot program to develop the abundant solar power resources in Dunhuang city of Northwest China's Gansu province. So far, the solar power plant built by China Guangdong New Energy Development Co (CGNEDC), a subsidy of CGNPC, which began construction on Aug 28, 2009, has generated 1.07 million kWh of electricity, and the SDIC project, which started construction on Sep 8, 2009, has generated 1.48 million kWh of electricity. 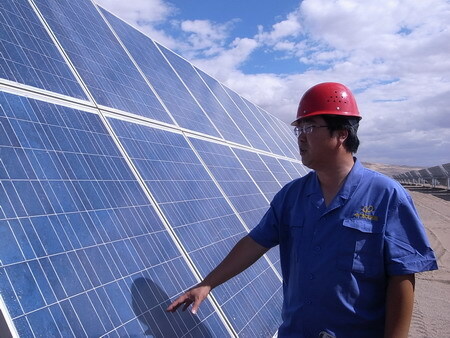 The statistics collected in the first three months of this year showed that actual power generation was better than predicted, said Ren Tao, general manager of SDIC Dunhuang Solar Power Co. This year is a construction year to accumulate statistics for further development, he added. The State Council, China's cabinet, has set a strategic target to build a million-kW level solar power base in Dunhuang by 2020. Dunhuang has submitted the 240-mW solar PV development plan involving six power enterprises, CGNPC, SDIC Electric Power, GD Power Development Co, China Datang Corp Renewable Power Co, CHINT Group and China WindPower Group, to the provincial government and awaits approval.